Fish meets fire during Judy’s next grilling class! Judy Purcell will be back at Farm Stand Friday to grill samples of Callicrate pork, seasoned with her homemade rubs, on Friday Aug. 5 from 3 to 6 p.m! 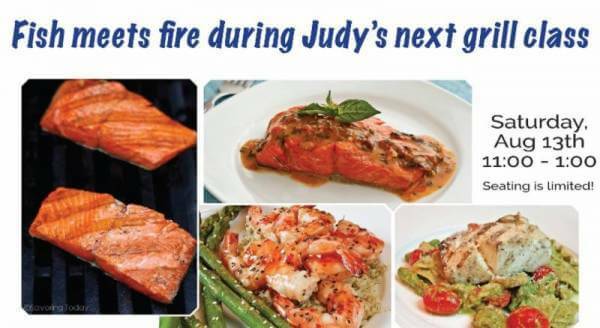 Judy is offering her last grilling class of the summer on Saturday, August 13, at Ranch Foods Direct. Her topic will be how to grill fish and seafood. CLICK HERE to sign up. She promises to demystify the magic of marinades and brines while concocting simple sauces right before your eyes. You’ll get to sample everything and take home recipes. CLICK HERE for Judy’s delicious beef skillet fajitas recipe, which can be used to showcase fresh, local peppers that are now in season! It’s one of many from her Savoring Today blog.